Ethereal edgy harmonizing vocals buried behind the carefully arranged guitar slice and the monochromatic drum brush, Leo and Cassandre are creating psychedelic, indie folk music that is generously compared to Brian Jones Massacre. Their about section states that are a duo Encouraged and inspired by the French musical collective Jericorp, who described ELVYN RHUD “as a gathering of Chris Isaak, lots of love and too much Cough Syrup.” This observant narrative blends their sophisticated intelligence and penchant for the avant garde. The EP dropped by Pyrrhic Victory Records in October features three tracks including the haunting, otherworldly sounds of “Orange is For Love”. Formerly flatmates now a couple, this song is not your common love song but it does display their love of creating a song that buries itself into your conscious. Artistically arranged, this composition is creating a buzz both in the States and abound in France where the pair resides. The video for this track bleeds with existential images of people who look like wax figures complete with a cracked skull like an egg and one man sitting up in a chair with a lifeless look on his face. Swirling gazy shift shaping swirls of what looks like what paint being mixed with the prominent Blood orange background. What looks like amoebas (to me) slither and dance with bursting mollusks to complete this head trip of a viewing. “People in Hampton Court Don’t Care About Dying” is named for the city of London, a city that holds special memories for the couple. The track is the darkest of the trio with BJM style vocals bred under rippling synth and well timed glassy sounding guitar. The pace rolls in a languid manner for the duration of this 2 min and 15 track. “La Movement Perpetual” is a purely instrumental relying on a steady, brassy guitar riffs which flourishes. The occasional pop of the drum cymbal is used to maximum effect. This song feels like slow rolling March afternoon in London. Sophisticated arrangements and stark melodic cut ins will make this band a must for synth driven, artistically woven playlist. 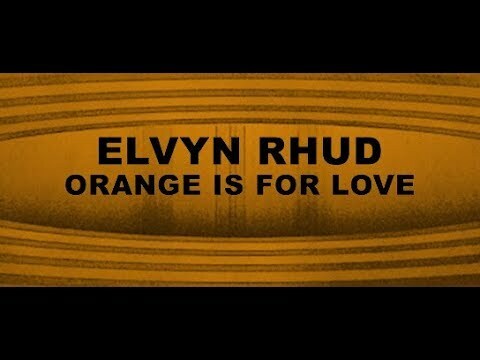 Keep your eye on Elvyn Rhud.